Vee24’s platform allows you to mix and match a wide variety of engagement types and experiences to optimize every channel. VIP customers looking at high priced products can be directed straight to a concierge service with one-on-one live video chat and screen sharing. High-volume transactional engagements can be routed to traditional multi-threaded chat that include a mix of integrated BOTs and live agent for quick and efficient responses. Companies with a large existing telephone channel can digitize the customer experience with screen share and co-browse and greatly reduce time-to-resolution. Virtually any live engagement scenario can be mixed with the right set of technologies to yield the maximum value for both your customer and your company. 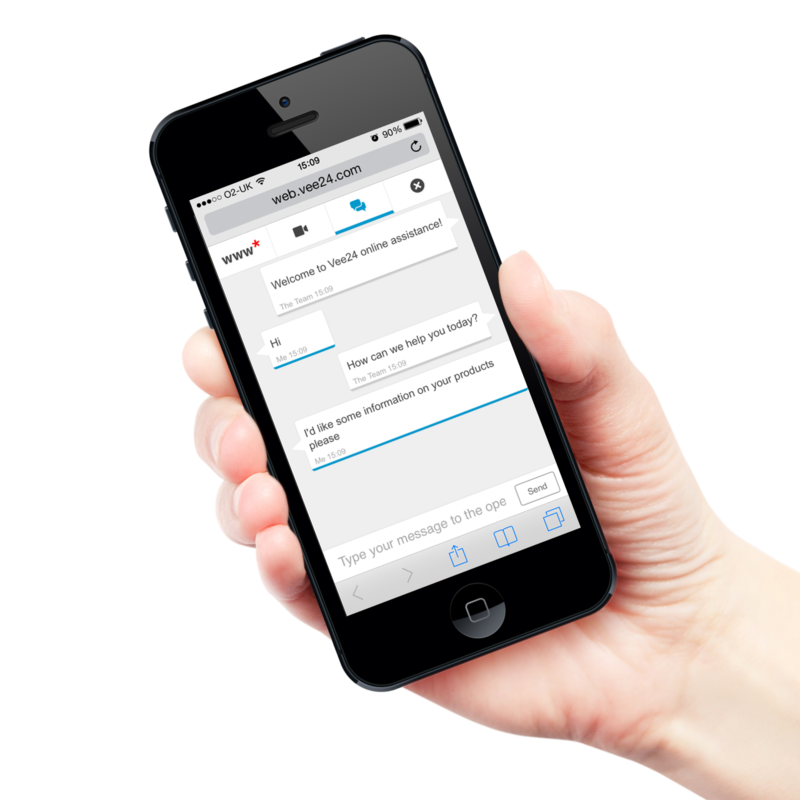 Vee24’s Text Chat solution distinguishes itself from other products in a variety of ways. For high-volume but low-value engagements, agents can connect with multiple customers at once using our multi-threaded text chat feature. Leveraging canned chats to respond to frequent scenarios and industry-standard features like spelling and grammar check, agents can quickly and efficiently handle high-volume channels to reduce the overall cost of servicing customers in less valuable use cases. In addition, our multi-threaded text chat solution includes co-browsing functionality. The ability to direct a customer to a specific webpage as you engage with them can really increase the power of text chat. Effortlessly pointing a customer to the right digital space by co-browsing cuts down time needed to resolve your customer’s query and delivers a seamless experience. It also provides your agents with an extra tool to reduce the challenge of describing or manually linking a customer to the correct place. The Vee24 Live Engagement Platform supports live video chat across any device, browser, and operating system without any plugins or downloads on the customer side. The video can be one-way or two-way as can the audio. If your live engagement center has merchandise available for display, this experience can be optimized using our multi-camera feature. This feature allows the agent to seamlessly switch between a forward-facing camera that shows the agent to a separate desk camera that has been set up to optimally display your products. In the case of retailers that sell larger more complex items like cars, furniture or appliances, Vee24’s mobile camera feature converts your showroom into a live digital marketplace. Sales teams can switch the engagement to a mobile camera that allows them to give online customers a tour of a brick and mortar store and go truly “hands-on” with a product demonstration or walkthrough. Whether conducting a text or live video chat, agents can co-browse with customers. This feature allows both parties to navigate their live engagement session to specific webpages on your website. Once an agent co-browses the customer to a product or help page. The customer can then freely scroll and manipulate the page as they see fit. The co-browse capability is not just limited to webpages, but also allows for document asset sharing. With this feature, the agent has the ability to push PDFs, videos, PowerPoint presentations, or virtually any type of marketing / sales / support collateral directly to your customer’s browser. These assets can be downloaded or printed by the customer right from the live engagement session with the click of a button. To curate your customer’s experience through an even more engaging medium, agents can also screenshare with customers. Like all components to our Live Engagement Platform, screensharing takes place right over the customer’s browser without the download of any plugins of software. Our screenshare capabilities includes the ability to scroll through a long page with the customer or high- light sections of information that are important. In addition, Vee24’s screenshare provides a critical advantage: co-form fill. Our co-form fill functionality provides the highest touch method of assisting customers by allowing agents and customers to jointly enter data into a form or widget on your web- site. Vee24’s Live Chat Engagement Platform also supports powerful multi-party engagements that allows an agent to bring in another expert or supervisor into a conversation for problem solving or additional expertise. This is supported in both text chat as well as live video chats. All participants, the customer and the multiple agents, share an engagement hub and can have seamless multi-party audio and video conversations. This multi-party mode also supports co-browsing and screen sharing. The presenting agent can transfer sharing rights to any other agent who can then share their screen with the parties. Stores aren’t always the best environment for dealing with issues. VeeKiosk allows customers to speak with an expert from your support team, while looking together at product issues, billing and forms, or financing options. With VeeKiosk, store staff can concentrate on core sales, while upsells, financing, technical support and other inquiries can get instant, personal service at the kiosk via live video chat engagement.